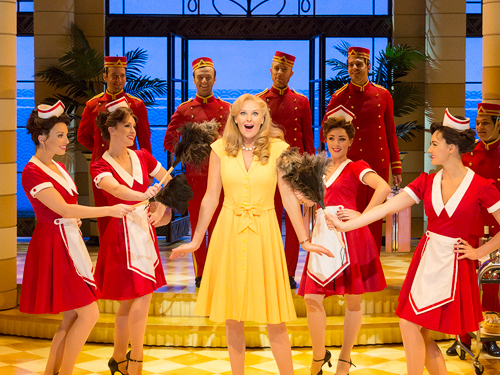 As a musical fanatic I try to see every new show as soon as it opens in London's West End and so I made a trip down to Dirty Rotten Scoundrels several months ago, during previews. Despite having all the classic elements for me to fall head over heels in love with it, I left the theatre feeling disappointed. Sure, I enjoyed some bits and even hummed a song or two afterwards, but there were a lot of elements that didn't work for me at the time. Maybe my expectations were too high. Maybe I wasn't in the right mindset. Or maybe the production wasn't quite up to scratch yet during those early days. Forward a few months and I receive an unexpected invite to the 'digital press night' for Dirty Rotten Scoundrels. Always willing to give a show a second chance, I RSVP-ed as quickly as my fingers were able to type a message beyond "assad;dg;sadgs yes please!" I was really excited to see the show again - if only for the opportunity to meet up with fellow theatre bloggers beforehand and getting the chance to meet some cast members after (per the very tempting invite). I hoped that I would like the show more a second time around, what I hadn't expected was that I would absolutely love it to bits! The hilarious escapades of the scoundrelous characters were an absolute hoot and I found the tunes incredibly catchy, even days later I'm still singing the songs (in my head, that is). The story centers on two con men scheming their way to riches in the French Riviera. Lawrence (Robert Lindsay) is a seasoned professional; suave, clever and very successful. The younger Freddy (Rufus Hound) on the other hand is loud, arrogant and happily brags about his achievements, rather than staying under the radar. When the two men meet, Lawrence sees Freddy as a nuisance at first and intents to ignore him so he goes away. But as they are forced to scheme together their competitiveness rises and they place a bet on who can con the newly arrived American soap queen Christine Colgate (Katherine Kingsley) out of her money... and her underwear. 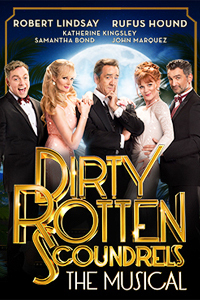 With big and glittery show numbers, lavish sets, mistaken identities, catchy songs, glamorous costumes and a dash of romance thrown in, Dirty Rotten Scoundrels has all the elements of a true classic musical comedy along the likes of Top Hat and Singin' in the Rain. But rather than focus on the romantic side of the story, DRS relishes in its outrageous humour, which is where its true strengths lie. From the subtle but very effective comedic timing of Lindsay and Kingsley to the slapstick qualities Hound brings to the character of Freddy (and even more so to that of Ruprecht, a persona he takes on during one of cons), it's a laugh-out-loud funny affair and an absolute joy to watch. There are a few things that didn't feel 100% perfect to me yet. For a musical, the voices of the two male leads aren't entirely up to scratch (although in the case of Freddy it's quite befitting and endearing) and I also found that the show struggles between looking and feeling like it's taking place in the early-20th century yet referencing modern names and places, which became a bit confusing at times. These minor niggles aside, I cannot fault the production or its sensational cast. 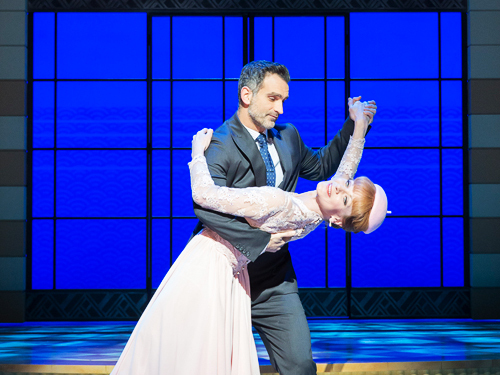 While I'm sure the jolly atmosphere of our digital press night group helped the mood along nicely, I am also more than happy to admit that I was wrong before and that this outrageously fun show has the potential to become one of the West End greats. Furthermore, the digital press night organised by Laughing Buddha was one of the most entertaining nights I've ever spend inside a theatre. In recent months I've been lucky to attend press nights for some major West End shows through work, but other than a complimentary drink and programme this experience doesn't differ from when I attend the show as a regular audience member. However, the organisers of the digital press night took it a major step further for us theatre fanatics, bloggers and reviewers. Before the show there was the opportunity to learn some of the dance moves from cast members, followed by a private pizza party in the bar. During the interval we were entertained with drinks and snacks, and after the show a lucky few (including yours truly) received Facebook prizes for our Tweets, finishing the evening with even more drinks and a mingle with cast members - including leads Rufus Hound and Robert Lindsay, who were true legends. I already had a fantastic time watching the musical on stage, but the super fun show-themed extras throughout the night made it a truly memorable experience. Many thanks to Richard from Laughing Buddha for the invite! 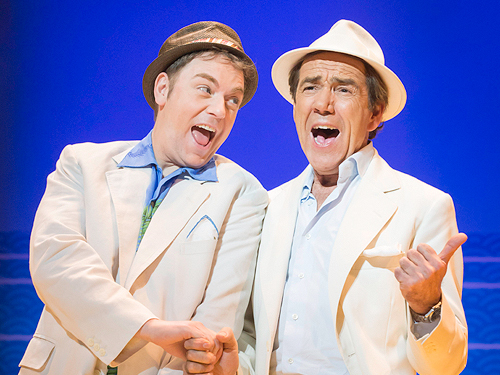 Dirty Rotten Scoundrels is playing at the Savoy Theatre and is currently taking bookings until 7 March 2015.